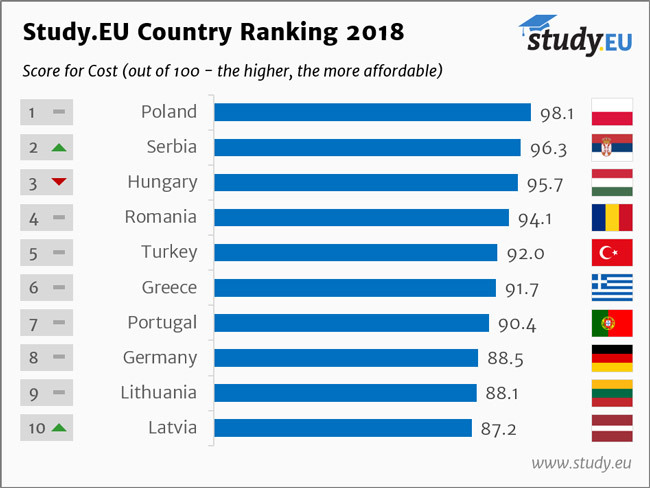 Data informing the ranking include university world rankings, governmental and university information on study programmes and tuition fees, and data from sources including Eurostat, the UN, and the OECD regarding cost of living, unemployment, quality of life, and safety in the various countries. The ranking is based on scores in three areas: Education, Cost, and Life & Career. For the first time, this year’s analysis incorporates a score for “personal safety” in the Life & Career area, reflecting the importance of this consideration for today’s international students. Of the three dimensions, Education (i.e., quality of education) is weighted the highest, making up 45% of the total score, with Cost accounting for 30% and Life & Career scores contributing the final 25%. These three key factors are used to generate an overall score for each country out of 100. As the following table reflects, other European destinations ranked among the top 10 are, from second to tenth, the UK, France, Netherlands, Russia, Switzerland, Sweden, Belgium, Italy, and Poland. The 2018 ranking marks two firsts: the first time for Russia making it into the top 5 and the first time for Poland to be counted among the top 10. 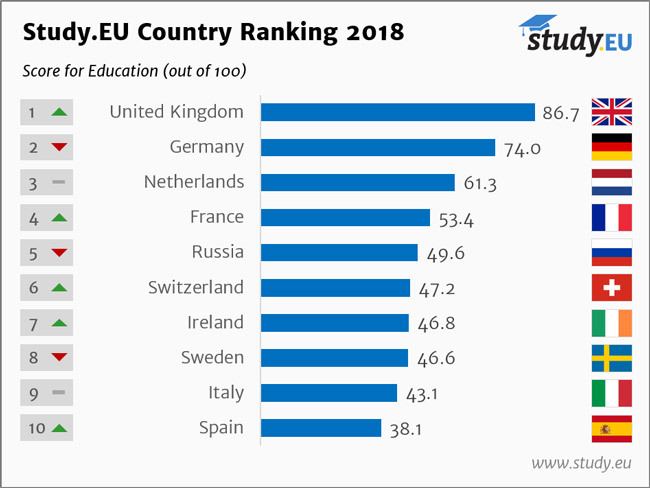 Looking just at Education factors, the UK is ranked first by a wide margin with a score of 86.7% versus the next highest scores of Germany (74%), Netherlands (61.3%), and France (53.4%). This dimension is scored according to performance in university rankings, indicators of teaching quality, and number of English-taught bachelor’s and master’s programmes. When it comes specifically to teaching quality, as measured by staff-to-student ratios and academic reputation surveys, Switzerland, the Netherlands, and Germany score the highest. Life & Career scores, which represent 25% of the overall score contributing to a country’s ranking, are ever more significant given how much students think about their study experience as well as post-graduation outcomes today. 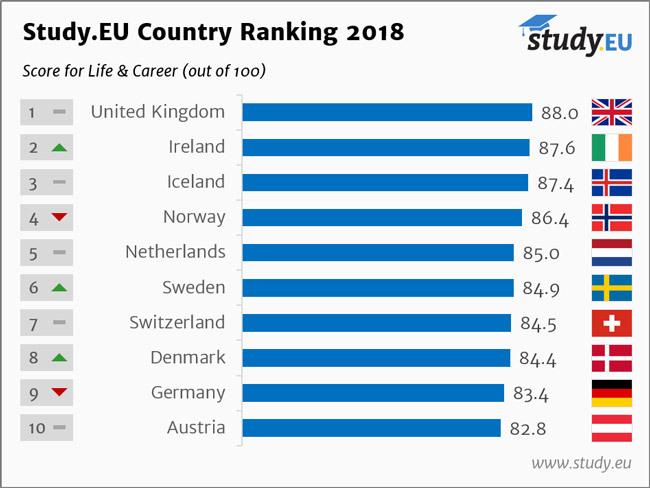 The factors going into Life & Career are English proficiency among the population, UN World Happiness Index data, unemployment rates for the tertiary-educated, and personal safety indicators. The leading countries in this area are the UK (88%), Ireland (87.6%) Iceland (87.4%), Norway (86.4%), and Netherlands (85%). At the end of the day, the overall impression one has from the ranking is of a balanced field across Europe. 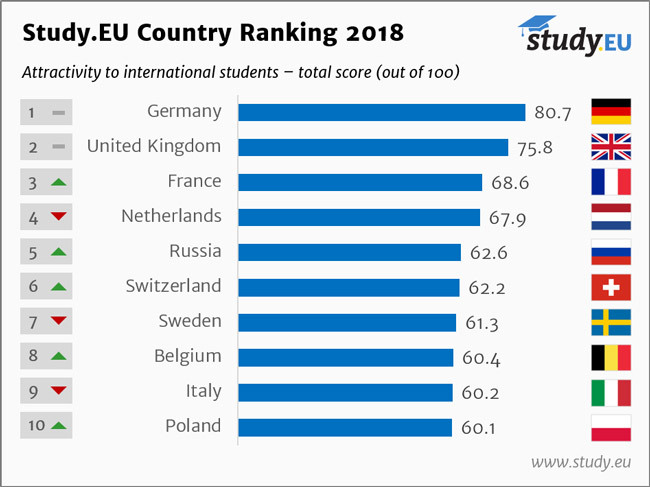 Study.EU highlights that despite Germany’s overall leadership position, many other European destinations offer distinct advantages for international students. This entry was posted in Europe, Germany, Higher Education, Most Popular, Regions, Research and tagged student enrolment, colleges with international students, college admissions, higher education statistics, education abroad.